With a total water surface area of more than 400 square meters and a depth of up to 3 meters, our organic natural bathing pond is definitely one the highlights on our area and at the same time it is perfect for cooling on hot summer days. A natural bathing pleasure awaits our guests in front of a dreamlike mountain backdrop, directly in the heart of Leogang. A cool refreshment on hot days – our organic natural bathing pond. 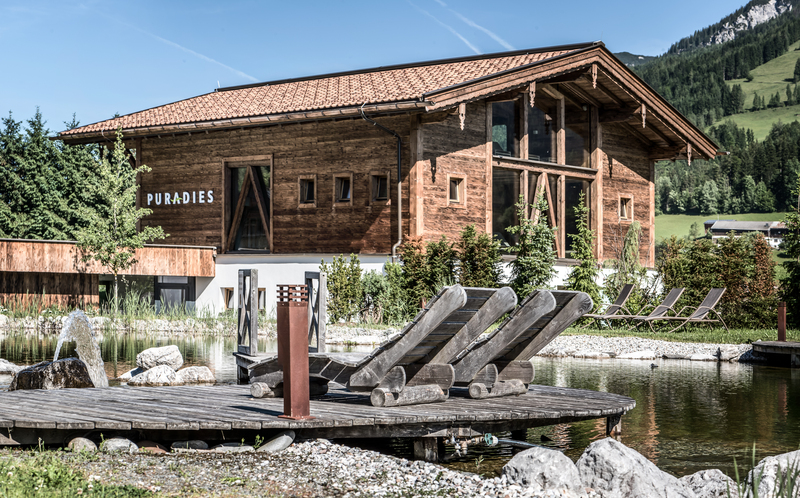 Our bathing pond is adjacent to our „Badhaus“ and invites our guests for a refreshing cooling after a hot day in the Salzburg mountains and at the same time it is a place where relaxing comes easy. But it is also a welcome opportunity to bring the day to a close after a mountain bike- or motorcycle-tour. Our bathing pond is sort of an "outdoor water- and relaxing area" with a beautiful view of the Asitz (local mountain) and the surrounding mountains. This is where our guests enjoy the sun and relax at the bathing jetties before they head back to the chalet or to the hotel. Sun loungers are on-site for relaxation and regeneration and we are glad to provide this highlight to our holiday guests in the summer and to be one of the few hotels with an own bathing pond. We are looking forward to you and also to relaxing & restful days at our organic natural bathing pond.